This article is about the Western tradition. For the Sinospheric tradition, see Mandate of Heaven. For various rulers who claim a divine relationship, see God emperor (disambiguation). Outside of Christianity,[clarification needed] kings were often seen as either ruling with the backing of heavenly powers or perhaps even being divine beings themselves. However, the Christian notion of a divine right of kings is traced to a story found in 1 Samuel, where the prophet Samuel anoints Saul and then David as mashiach or king over Israel. The anointing is to such an effect that the monarch became inviolable, so that even when Saul sought to kill David, David would not raise his hand against him because "he was the Lord's anointed". Adomnan of Iona is one of the earliest Christian proponents of this concept of kings ruling with divine right. He wrote of the Irish King Diarmait mac Cerbaill's assassination and claimed that divine punishment fell on his assassin for the act of violating the monarch. Adomnan also recorded a story about Saint Columba supposedly being visited by an angel carrying a glass book, who told him to ordain Aedan mac Gabrain as King of Dal Riata. Columba initially refused, and the angel answered by whipping him and demanding that he perform the ordination because God had commanded it. The same angel visited Columba on three successive nights. Columba finally agreed, and Aedan came to receive ordination. At the ordination Columba told Aedan that so long as he obeyed God's laws, then none of his enemies would prevail against him, but the moment he broke them, this protection would end, and the same whip with which Columba had been struck would be turned against the king. Adomnan's writings most likely influenced other Irish writers, who in turn influenced continental ideas as well. Pepin the Short's coronation may have also come from the same influence. The Carolingian dynasty and the Holy Roman Emperors also influenced all subsequent western ideas of kingship. In the Middle Ages, the idea that God had granted earthly power to the monarch, just as he had given spiritual authority and power to the church, especially to the Pope, was already a well-known concept long before later writers coined the term "divine right of kings" and employed it as a theory in political science. For example, Richard I of England declared at his trial during the diet at Speyer in 1193: "I am born in a rank which recognizes no superior but God, to whom alone I am responsible for my actions", and it was Richard who first used the motto "Dieu et mon droit" ("God and my right") which is still the motto of the Monarch of the United Kingdom. With the rise of nation-states and the Protestant Reformation in the late 16th century, the theory of divine right justified the king's absolute authority in both political and spiritual matters. Henry VIII of England declared himself the Supreme Head of the Church of England, and exerted the power of the throne more than any of his predecessors. 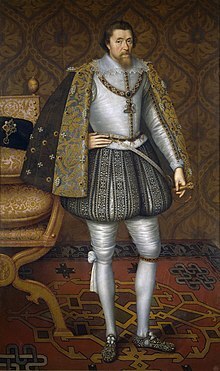 As a political theory, it was further developed by James VI of Scotland (1567–1625), and came to the fore in England under his reign as James I of England (1603–1625). Louis XIV of France (1643–1715) strongly promoted the theory as well. James's reference to "God's lieutenants" is apparently a reference to the text in Romans 13 where Paul refers to "God's ministers". One passage in scripture supporting the idea of divine right of kings was used by Martin Luther, when urging the secular authorities to crush the Peasant Rebellion of 1525 in Germany in his Against the Murderous, Thieving Hordes of Peasants, basing his argument on St. Paul's Epistle to the Romans 13:1–7. On the other hand, Aquinas forbade the overthrow of any morally, Christianly and spiritually legitimate king by his subjects. The only human power capable of deposing the king was the pope. The reasoning was that if a subject may overthrow his superior for some bad law, who was to be the judge of whether the law was bad? If the subject could so judge his own superior, then all lawful superior authority could lawfully be overthrown by the arbitrary judgement of an inferior, and thus all law was under constant threat. Towards the end of the Middle Ages, many philosophers, such as Nicholas of Cusa and Francisco Suarez, propounded similar theories. The Church was the final guarantor that Christian kings would follow the laws and constitutional traditions of their ancestors and the laws of the presumptive god and of justice. Similarly, the Chinese concept of Mandate of Heaven required that the emperor properly carry out the proper rituals and consult his ministers; however, this concept made it extremely difficult to undo any acts carried out by an ancestor. Ahura Mazda gives divine kingship to Ardashir. Khvarenah (Avestan: 'xᵛarənah;' Persian: far) is a Zoroastrian concept, which literally means glory, about divine right of the kings. In Iranian and Zoroastrian view, kings would never rule, unless Khvarenah is with them, and they will never fall unless Khvarenah leave them. 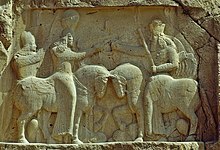 For example, according to the Kar-namag of Ardashir, when Ardashir I of Persia and Artabanus V of Parthia fought for throne of Iran, on the road Artabanus and his contingent are overtaken by an enormous ram, which is also following Ardashir. Artabanus's religious advisors explain to him that the ram is the manifestation of the khwarrah of the ancient Iranian kings, which is leaving Artabanus to join Ardashir. Before the Reformation the anointed king was, within his realm, the accredited vicar of God for secular purposes (see the Investiture Controversy); after the Reformation he (or she if queen regnant) became this in Protestant states for religious purposes also. In England it is not without significance that the sacerdotal vestments, generally discarded by the clergy – dalmatic, alb and stole – continued to be among the insignia of the sovereign (see Coronation of the British monarch). Moreover, this sacrosanct character he acquired not by virtue of his "sacring", but by hereditary right; the coronation, anointing and vesting were but the outward and visible symbol of a divine grace adherent in the sovereign by virtue of his title. Even Roman Catholic monarchs, like Louis XIV, would never have admitted that their coronation by the archbishop constituted any part of their title to reign; it was no more than the consecration of their title. 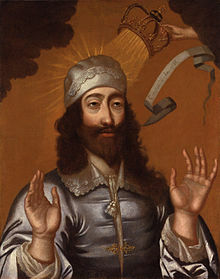 In England the doctrine of the divine right of kings was developed to its most extreme logical conclusions during the political controversies of the 17th century; its most famous exponent was Sir Robert Filmer. It was the main issue to be decided by the English Civil War, the Royalists holding that "all Christian kings, princes and governors" derive their authority direct from God, the Parliamentarians that this authority is the outcome of a contract, actual or implied, between sovereign and people. In one case the king's power would be unlimited, according to Louis XIV's famous saying: "L' état, c'est moi! ", or limited only by his own free act; in the other his actions would be governed by the advice and consent of the people, to whom he would be ultimately responsible. The victory of this latter principle was proclaimed to all the world by the execution of Charles I. The doctrine of divine right, indeed, for a while drew nourishment from the blood of the royal "martyr"; it was the guiding principle of the Anglican Church of the Restoration; but it suffered a rude blow when James II of England made it impossible for the clergy to obey both their conscience and their king. The Glorious Revolution of 1688 made an end of it as a great political force. This has led to the constitutional development of the Crown in Britain, as held by descent modified and modifiable by parliamentary action. In Japan, the Son of Heaven title was less conditional than its Chinese equivalent. There was no divine mandate that punished the emperor for failing to rule justly. The right to rule of the Japanese emperor, descended from the sun goddess Amaterasu, was absolute. The Japanese emperors traditionally wielded little secular power; generally, it was the duty of the sitting emperor to perform rituals and make public appearances, while true power was held by regents, high-ranking ministers, a commander-in-chief of the emperor's military known as the shōgun, or even retired emperors depending on the time period. In the Malay Annals, the rajas and sultans of the Malay States (today Malaysia, Brunei and Philippines) as well as their predecessors, such as the Indonesian kingdom of Majapahit, also claimed divine right to rule. The sultan is mandated by God and thus is expected to lead his country and people in religious matters, ceremonies as well as prayers. This divine right is called Daulat (which means 'state' in Arabic), and although the notion of divine right is somewhat obsolete, it is still found in the phrase Daulat Tuanku that is used to publicly acclaim the reigning Yang di-Pertuan Agong and the other sultans of Malaysia. The exclamation is similar to the European "Long live the King", and often accompanies pictures of the reigning monarch and his consort on banners during royal occasions. In Indonesia, especially on the island of Java, the sultan's divine right is more commonly known as the way, or 'revelation', but it is not hereditary and can be passed on to distant relatives. Among groups of English Protestant exiles fleeing from Queen Mary I, some of the earliest anti-monarchist publications emerged. "Weaned off uncritical royalism by the actions of Queen Mary ... The political thinking of men like Ponet, Knox, Goodman and Hales." "Ponet's treatise comes first in a new wave of anti-monarchical writings ... It has never been assessed at its true importance, for it antedates by several years those more brilliantly expressed but less radical Huguenot writings which have usually been taken to represent the Tyrannicide-theories of the Reformation." ^ Kar namag i Ardashir 4.11.16 and 4.11.22-23. One or more of the preceding sentences incorporates text from a publication now in the public domain: Phillip, Walter Alison (1911). "King § Divine Right of Kings" . In Chisholm, Hugh. Encyclopædia Britannica. 15 (11th ed.). Cambridge University Press. p. 806. ^ a b c d e Phillip 1911, p. 806. ^ Beasley, William (1999). "The Making of a Monarchy". The Japanese Experience: A Short History of Japan. University of California Press. p. 29. ISBN 978-0-520-22560-2. ^ Ramanujan, A.K. (2011). Poems of Love and War: From the Eight Anthologies and the Ten Long Poems of Classical Tamil. Columbia University Press. ISBN 978-0-231-15735-3. ^ N. Subramanian (1966). Śaṅgam polity: the administration and social life of the Śaṅgam Tamils. Asia Pub. House. ^ Dickens, A. G. (1978). The English Reformation. London & Glasgow: Fontana/Collins. p. 399. ^ a b Dickens, A. G. (1978). The English Reformation. London & Glasgow: Fontana/Collins. p. 391. ^ Dickens, A.G. (1978). The English Reformation. London & Glasgow: Fontana/Collins. p. 358. ^ Adams, C. F. (1850–56). The Works of John Adams, with Life. 6. Boston. p. 4.